Supports vCard files from Outlook, GSuite, iCloud, Skype, etc. After viewing vCard data, a user can transfer VCF files to multiple file formats. This application provides an option to convert VCF files to CSV and PST file format. 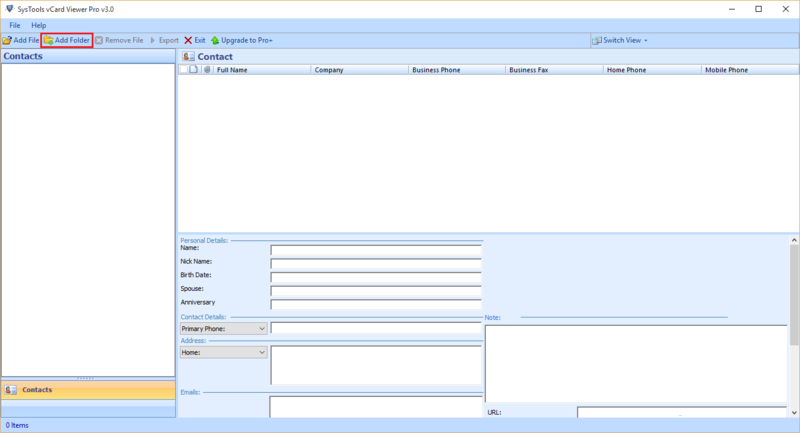 Moreover, it supports migration of both single and multiple contacts vCard also. 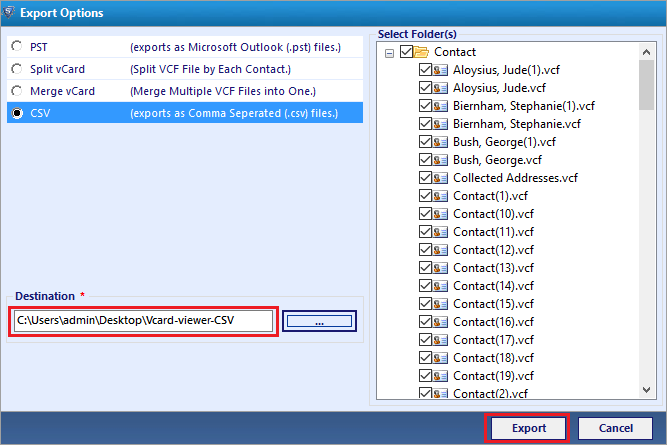 The vCard Viewer Pro Tool allows the users to export multiple VCF Contacts as well as multiple VCF files in batch. This utility helps to export the VCF file contacts in bulk to different file formats without loss of any associated information. Tool provides selective contacts export functionality so that a user can select and export only the required contacts from the contacts list of a VCF file effortlessly. The Pro tool provides the option to export only the desired vCard files. It helps to avoid the conversion of the unwanted VCF files from the browsed vCard files list. The vCard Viewer Pro Tool users are given the provision to split the VCF files and VCF contacts selectively as well as in bulk form. Moreover the tool maintains the entire contact information such as Name, Contact image, Address, Email, etc. intact even after the vCard split. 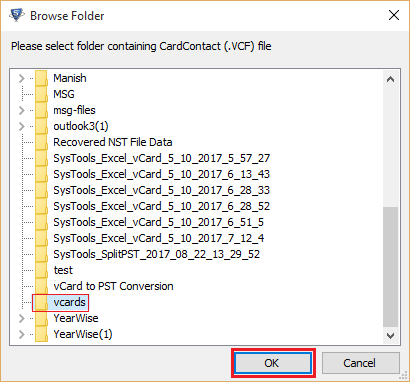 The Pro Version of vCard Viewer tool allows the users to merge VCF contacts or VCF files selectively as well as in batches by selecting Add Folder option. Users can merge the VCF contacts from various sources together to form a single vCard file. 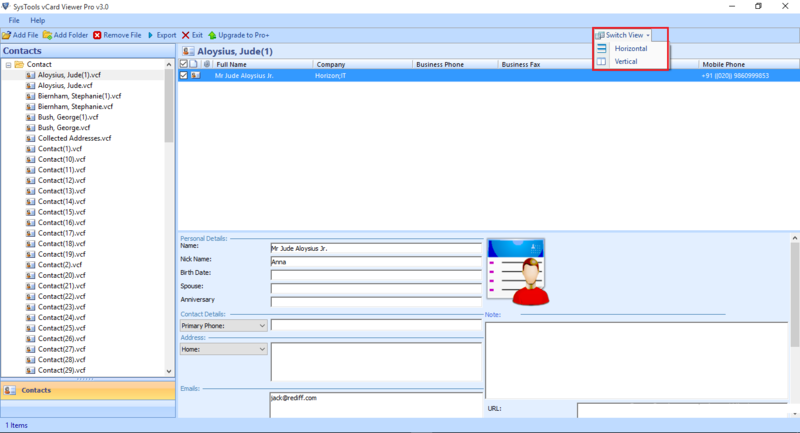 Another impressive feature of this software is that it provides option to sort all contacts stored within the vCard file. A user can sort all of them based on his or her requirement based on date, size or alphabetic order etc. This feature makes it easy for the users to manage all contacts according to their convenience. A user can use this vCard Viewer Pro tool to export VCF files to CSV and Outlook PST, independent of their native application without any hassle. It is a standalone utility and supports VCF file of all platform like MS Outlook, Thunderbird, Gmail etc. The software does not require any extra installation to convert vCard files. 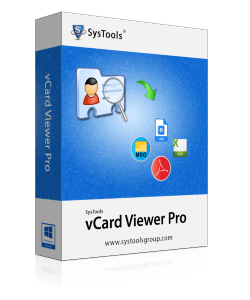 The Demo version of SysTools vCard Viewer Pro Tool is vCard Viewer which preview any type vCard file of different platforms. If you are using Windows 10, 8, 7 or Vista, then please launch the tool as "Run as Administrator". Supported Platforms: Gmail, GSuite, iCloud, Skype, Android, IOS, Windows mobile, WhatsApp, etc. Can I know, How this tool works in exporting VCF contacts? Is it possible to convert VCF files to PST format without MS Outlook installation on the local machine? Yes, you can easily export VCF files to PST format even without having MS Outlook installed on the system. Is this software capable to export Modified or Altered VCF Files? Yes, a user can easily export altered VCF contacts or files to various formats along with their attributes without any hassle. Is it possible to add multiple VCF files at a time using this application? Yes, with the help of Add folder option, a user can add a complete folder containing multiple VCF files at once. Does the software impose any limitation on the number of contacts while transferring VCF files? No, the tool does not impose any limitation on the number of contacts during the transfer of contacts from VCF to CSV and PST file format. One can export any size VCF file in just a few number of clicks. Does the application export all the images associated with any particular contact to other format? Yes, the software is smart enough to export all associated attachments also from vCard to Outlook PST and CSV file format. I must say that if anyone is looking for a tool to convert vCard to CSV format, go for this VCF Viewer Pro tool. It is an amazing creation by the developers with a simple and easy interface. It is a one-step solution to migrate vCard contacts without any limitation. Really, an ultimate tool that takes only few minutes to convert my 2GB of vCard to PST format quickly. The feature that I liked about the tool is that, it is a portable tool which can be installed anywhere without any compatibility issues. Thank you so much SysTools for this great help. Nice application! I liked all the features of VCF Viewer Pro tool. According to me, a great job has been done by the developers. Hope to see some more application like this by you in future.